I was excited to see one of the youngsters in its field Saturday here in Los Angeles. My dog Holtz and I were on the river bank and the youngster scratched dirt as it passed by in front of us on its road. The image quality is poor for it having been after sunset. After passing us it walked on a ways and then sat in its road to wait. I assumed it was waiting for us to leave, and we did. Another picture, not shown, suggests that several yards from the sitting youngster was another coyote. We are well into January 2011 and at least one youngster hasn’t dispersed. It acts towards Holtz and me much as its parents do, sending territorial messages upon seeing us. Sunday, in a different field near Pacific Coast Highway, I took two pictures of a coyote that appeared to be messaging Holtz by marking. Holtz was leashed. There were other people who didn’t have dogs who were already watching the coyote when Holtz and I came into the coyote’s view. I noticed the people and then I saw the coyote. The coyote didn’t poop until Holtz and I were in its view. Holtz sat at my side calmly and watched. The coyote looked at us and slowly walked away. Another coyote was barking in the distance. At other times, I’ve heard this group of coyotes really get going with the hollering when a siren passes by. A few years ago I would have thought that the pooping was a coincidence, that I had accidentally arrived at just the moment when the coyote had decided to attend to its necessaries. Now I’m inclined to see its poop timing as territorial and dog directed. A few years ago I would also have mistaken its look at us as friendly. After all, it is seemingly smiling like a dog. It may be smiling, but if so, not invitingly. Instead it is probably well satisfied by having told us so competently to stay away. This field, large and rodent filled, will have coyotes in it until it is paved or otherwise developed. Great Blue Herons also regularly dine on its rodents, a Northern Harrier hunts there and occasionally harasses the Herons, several Red-tailed Hawks hunt there, last year’s Great Horned Owl pair is rumored to be back, a Burrowing Owl is present as are American Kestrels, a White-tailed Kite, Cooper’s Hawks, White-crowned Sparrows, California Towhees, House Finches, and at least one rattlesnake. I heard from one man and from one account on a Flicker blog that the City, perhaps as long as two years ago, had trapped and destroyed the coyote group that was previously in this same area, responding to complaints from the neighborhood. I haven’t confirmed this as more than ‘talk’. Several years ago there did seem to be more coyotes in that area and if they were removed, new coyotes soon replaced them. A photographer there claims to have a recent picture of a male and female in that field coupling. I’ve been enjoying Janet’s posts, though one with some discomfort. I am hoping that Janet doesn’t encounter the dominant guy and its mother doing, well, you know, please not that…not that! Maybe a legitimate male will show up. I’m rooting for it! Posting written by Charles Wood. 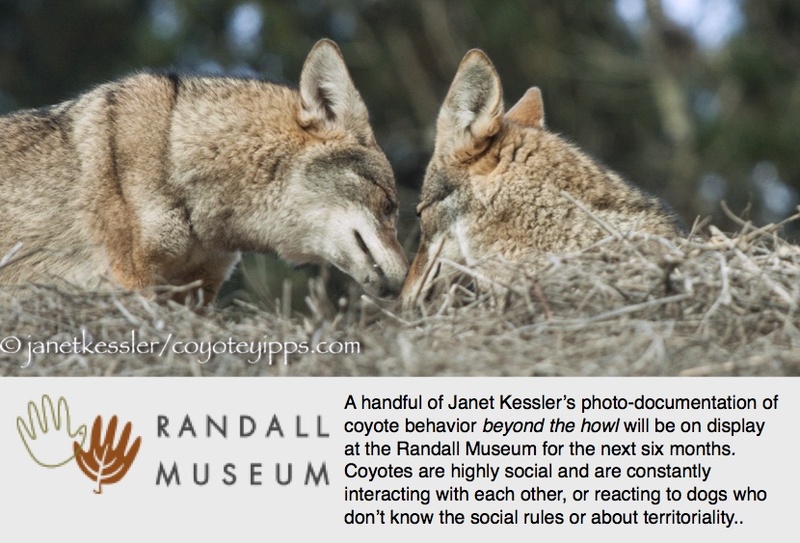 Visit Charles Wood’s website for these and more coyote photos:Charles Wood. His work is copyrighted and may only be used with his explicit permission.